On 7 March, the Harold Wood Friends Group, along with the Deputy Mayor of Havering, Cllr Dilip Patel, celebrated completing their One Million Campaign - one month ahead of schedule and in their 25th anniversary year - with prosecco, balloons and the completed totalizer. Their accomplishment is testament to the commitment of the 33 volunteers, eight of whom were among the original team of 16 involved when the shop officially opened in April 1993. The Harold Wood Volunteer Group launched their campaign last September in a bid to increase the £950,000 they had already raised for Rainbow Trust since 1993. Rainbow Trust Patron and Harold Wood shop founder and manager Pauline Obee OBE was thrilled to have reached their target and thanked everyone involved. “I am absolutely delighted,” she said. “We celebrate our 25th Anniversary in March, which is when we first leased the shop, and it is quite an achievement. My only regret is that the shop’s co-founder, the late John Penrose, isn’t here to see it. 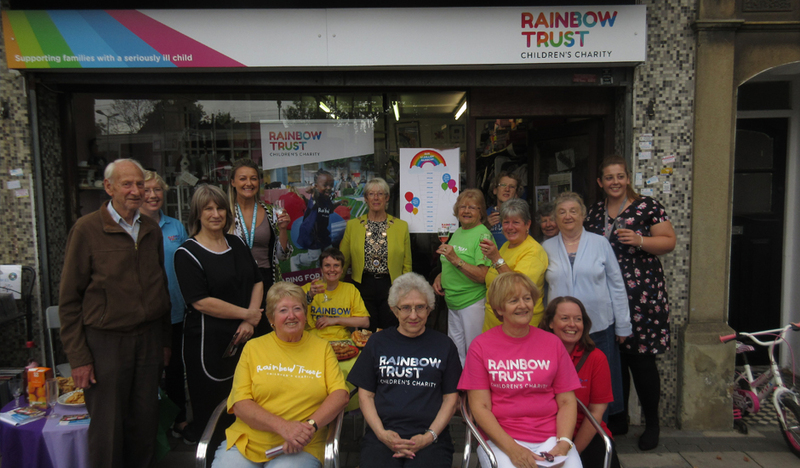 Community spirit has always been at the heart of the volunteer group and Pauline reminisced about a particularly successful fundraising effort in the early years which saw one resident from every road in Harold Wood come together to collect for Rainbow Trust. As well as volunteers in the shop there is an Outside Events Team comprising staff and a Friends Group who fundraise across Essex raising money for families caring for a seriously ill child. “We had a hugely successful Christmas with 11 fundraising events plus the number of donations we received was a huge surprise for everyone,” Pauline said. The group was founded after Pauline and John Penrose heard an interview with Rainbow Trust’s founder Bernadette Cleary on the radio. Pauline embraced the opportunity to use an empty shop for three months and ran jumble sales there two days a week. Looking beyond the campaign and anniversary celebrations Pauline’s team will continue working tirelessly. “We always have a milestone, I have always encouraged the staff to reach £100,000 and each time we meet that target we have a celebration,” she said.